The streets are always open... take a deep breath and just run. The NYC Half was my first "big" race and my first half marathon. Before I started training for this race, I literally never ran more than 4 miles in my life. By the end of the morning on March 18, I had run 13.1. Unreal! 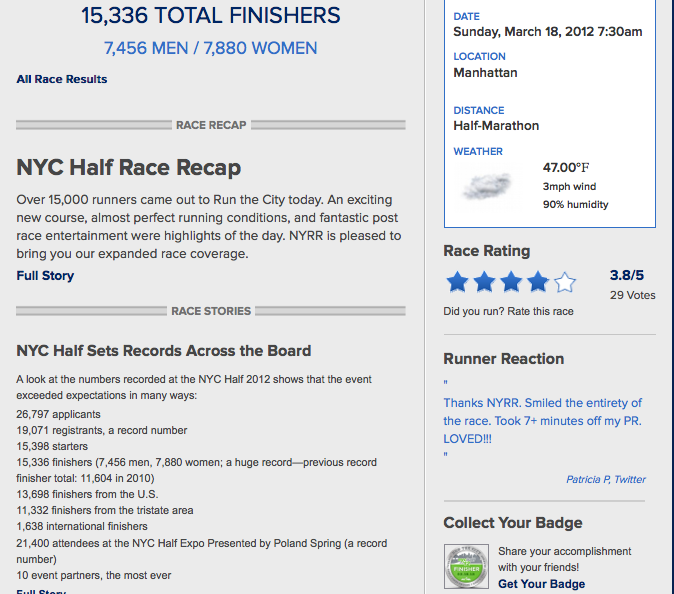 The 2012 NYC Half had a record number of runners: 15,000. Many of them were from overseas but there were definitely a lot of hometown people. The course started with a full 6 mile loop at Central Park, running through Times Square, down the West Side Highway and ended at the South Street Seaport. Its was like a tour of NY in 2 hours. On Friday I headed to the Expo at the Metropolitan Pavilion and picked up my race bib... #18383. The expo had a bunch of cool vendors and some nice giveaways, including free Tommie Cooper compression socks, Odewlla bars and smoothies, and Luna bars (yum!). 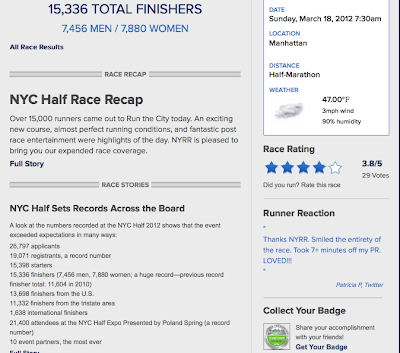 I also had to buy myself some official race gear, including the NYC Half running hat. Although it was a bit out of my grad-school budget I thought, "Hey, its my first half and I have to prove I ran it somehow!" So I got a sweatshirt and a hat. Plus the race T-shirt was nice but its SO green. Can't wear that everywhere without accidentally blinding one or two people. So I laid out my clothes and gear the night before, set about 6 alarms, ate some pasta, drank tons of water, and tried to sleep. That was the tricky part, I thought I would never fall asleep and just kind of laid there. I managed to fall asleep at some ungodly hour and woke up at another ungodly hour. Around 4:30 I got dressed, ate my pre-race Clif bar, and headed out the door to the long, lonely subway ride to the park. There were a decent amount of drunk people coming home from St. Patty's day celebrations as I'm sitting there in my compression socks and running shorts. They probably thought that I was the crazy one. Even the ones dressed as leprechauns. When I got to the park it was still dark, which was kind of eerie. I did a warm up run, stretched, waited on the huge line for the Porta potty and got into my corral. After the "official" start of the race it took me about 20 minutes to get to the starting line. That's what 15,000 runners will do to you. Pretty cool though to see the professional runners on their way out of the park as I just was about to cross the start (yeah, seriously... they were that fast). If you blinked, I think you would have missed them. 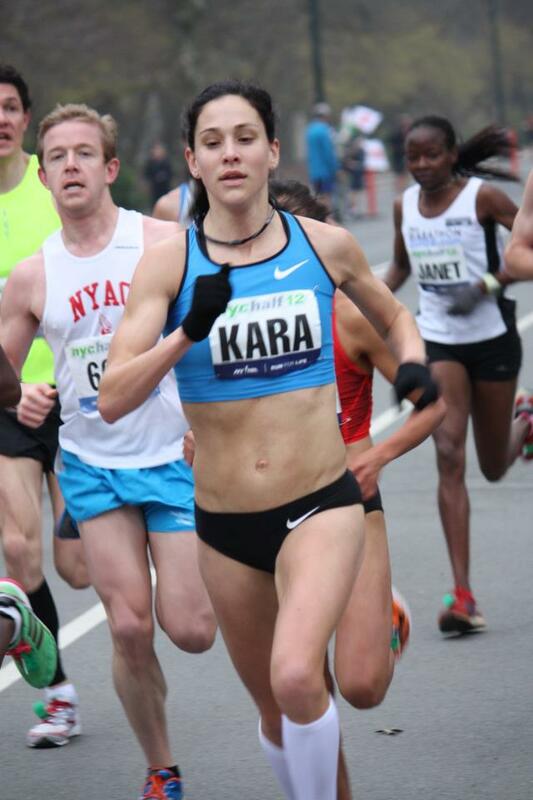 Including my inspiration, miss Kara Goucher..
Kara Goucher in the NYC Half. Photo by NYRR (nyrr.org). She finished in 1:06... what?!! Someone described it as her doing a "13.1 mile sprint through NYC"
The loop of Central Park was not as bad as it could have been. Thankfully I did a bunch of training runs on the hills of the park and trained my quads to get stronger and behave on those hills, otherwise it would have been killer. I saw so many people give up and walk up the Harlem hills but I mentally coached myself not to stop and walk... and I succeeded. Also it just so happened that Yellowcard's "Believe" came on while I was running up the hills which always inspires me to keep running. After the loop we exited the park and made our way through Times Square for miles 7-8. I ate my GU gel around this time to try to encourage my second wind to kick in. This stretch was the absolute best part of the race and made the $117 dollar price tag on this race totally worth it. When else can you run through an empty TS with crowds of people cheering you on?! My goal was not to trip and fall over a manhole and embarrass myself. Goal accomplished. Luckily my boyfriend Karl was waiting for me in TS and took the super awesome photo above. In all the professional ones I had my eyes closed and looked like I was having a seizure. Plus I think my legs look pretty damn good in that picture so I thought I'd share it with you. Crossing the finish line. Love the face on of the lady next to me. After TS we made our way to the West Side Highway. There was some good race entertainment including DJs and cheerleaders, which was cool. Kept me motivated on that super long stretch of road. We passed Chelsea Piers, then the WTC, and went through the tunnel under the southern tip of Manhattan. I saw people doing downwards and at first I was happy for a downhill. But I quickly realized that if we were going down we would have to go back up at some point... sure enough, coming out of the tunnel there was another hill. I thought "are you kidding me?! ", but the signs on the side of the road saying "800 meters to go" kept me going. I pushed on, couldn't believe I actually made it to the end, and cross the finish line. The post-race festival was at the South Street Seaport. I was a sight to see all those heat foiled people walking around. Must of looked like the strangest festival ever to all the nearby residents. It was a bit crowded though and the line for medal engravings basically went all the way to my apartment in Brooklyn. I passed on waiting. Overall though, the festival had alot of great entertainment and food. Great place to end a race. Post-race photo and warming up with my heat foil. 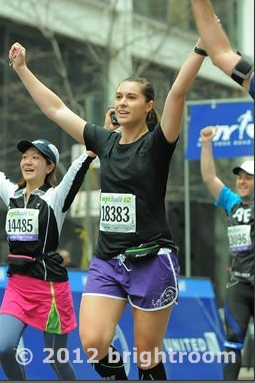 Did you run the NYC Half? What was your first half marathon? I loved your entry!!! 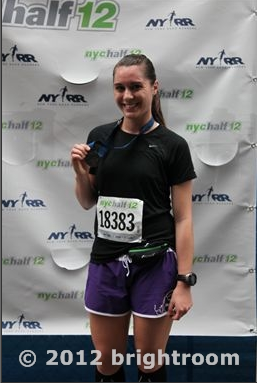 :) I hope to run next year, too! Have a happy running!